The scene is almost eerie: an abandoned red brick church in a Polish section of Greenpoint, Brooklyn, doors all apparently well shut. A bit of searching reveals an entrance with a buzzer, behind a rusted front gate. First buzz, nothing. Second buzz, and at this point you’d fully expect some wizened janitor to open the creaking door and glare. 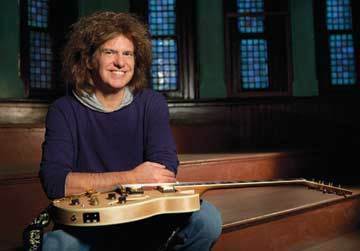 But no, it’s Pat Metheny, all smiles, hair tucked under a backwards Yankees cap. Inside, the entire carpeted ground floor is a makeshift concert stage-the rehearsal set of the Orchestrion tour, perhaps the most conceptually radical project Metheny has ever undertaken. The eye scans across a full ensemble’s worth of instruments, but they are set to play automatically, powered by a complex system of electromagnetic (solenoid) and pneumatic switches. A robot band, crudely put. There are drums (Jack DeJohnette’s old set) and percussion mounted at various heights and angles; an acoustic guitar and electric bass tacked up to a vertical board, with little felt hammers in place over each of the frets; mallets (Gary Burton’s) suspended above every bar of the vibraphone and marimba, enabling all note combinations at all times; two Yamaha Disklavier pianos at opposite ends of the room; two elegant wood cabinets displaying rows of clear glass bottles, air-blown to sound something like an organ or mellow woodwinds; and an upright metallic instrument known as the GuitarBot, invented by Eric Singer of the League of Electronic Musical Urban Robots (LEMUR). The GuitarBot, just one of LEMUR’s several contributions, gives the new music some of its most otherworldly, voicelike qualities. Of course there are many guitars: some normal, some with mechanical appendages, including the “strum-bots,” which will strum in Metheny’s recognizable, wrist-driven heartland style. One of Metheny’s Ibanez guitars has been made by Mark Herbert into a MIDI controller that triggers percussion and other instruments when Metheny picks the strings, touch sensitivity and all. Another Herbert product, a solenoid guitar inspired by Metheny’s encounter with Italian guitarist Paolo Angeli, was not on hand for ogling. Despite the gizmos, the music is almost wholly acoustic and full of heart-the opposite of what one might expect from machine-generated sound. Metheny’s pure, unadulterated guitar playing-and improvising-is all over the new album, Orchestrion (Nonesuch), and that will carry over to the live setting. 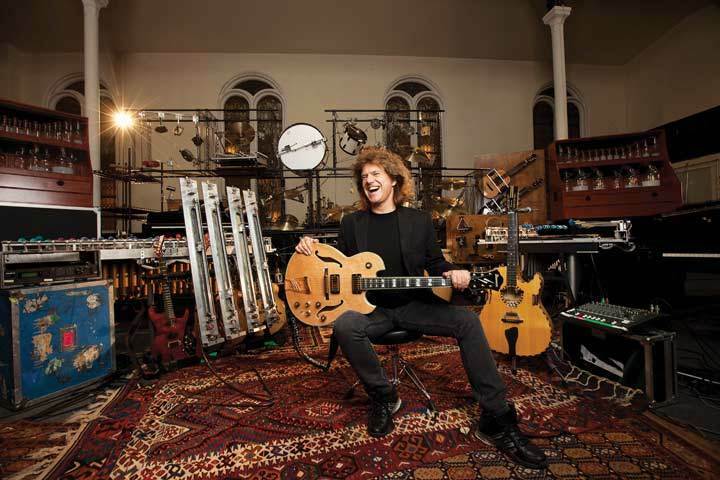 Using an advanced, idiosyncratic version of automated-instrument technology, Metheny is “recontextualizing the idea of what constitutes a solo performance by a single musician,” as he writes in his liner notes. He’s also raising provocative issues about jazz, musical culture and even society at large. Ironically, Orchestrion follows a relatively quiet 2009, during which Metheny and his wife welcomed their third child, Maya. “It’s the first year since I was 14 or 15 that I was not on the road, so it was a very interesting time,” he muses. For the teen prodigy turned mid-career jazz icon, it was a time to reflect, a time for family-and, wouldn’t you know, a time to confront the mother of all projects. The tour began in Europe; it arrives back in New York at the Town Hall on May 21 and 22. Pulling the music together artistically was the key challenge, but hardly the only one. “There’s the issue of getting the instruments to work,” Metheny explains, “but then they’ve got to work every day for about 150 gigs.” The fragile one-of-a-kind gear also needs to cross the ocean, bump around the U.S. throughout April and May, and depart again for eight June shows in South Korea and Japan. “Part of the thing is putting together a pretty significant spares kit for everything that could go wrong. Things you can swap out. But it’s a lot of sleepless nights.” And a lot of money too: “comparable to a full-blown Pat Metheny Group tour in expense,” according to Metheny’s longtime manager, David Sholemson.